A bunny bouquet with ornamental kale and a ceramic pitcher for a hoppin’ Easter event! Easter is a time of celebration for many families and is a holiday steeped in tradition. In many countries, Easter festivities begin on Palm Sunday for a period called the Holy Week where, those who observe this holiday, attend a week of events that are rich with symbolism that is reflected in the natural world and flowers. Palm Sunday falls on the Sunday before Easter and has a more solemn feel as it is the start of the Holy Week. Save the pastels for the Easter Sunday celebration as Palm Sunday is aptly named, utilizing palms and branches to decorate and initiate the Holy Week. Palms, in both ancient and current times, are signs of goodness, well-being, and victory and many worshipers use palm branches in church processionals or in ceremonies for the blessing of palms. 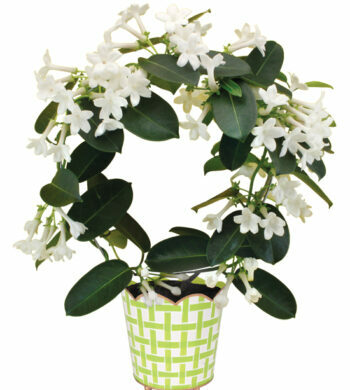 A fragrant jasmine plant has lush green leaves for an appropriate Palm Sunday floral gift. Palms and lush, green plants and arrangements are an appropriate gift for those who observe this holiday. Bringing a palm or fragrant, blooming plant to a church function or Palm Sunday event would be an appropriate and welcome gift during this season of renewal and peace. Green palms with white accents are the most common for Palm Sunday flower arrangements while other arrangements for church decorations will involve brighter colors like yellows, oranges, and reds. 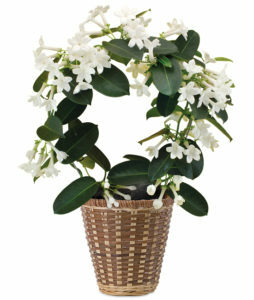 For example, a fragrant, green plant would be a suitable item to bring to a Palm Sunday gathering. As we approach the end of the Holy Week with a final Easter celebration, bright and cheery bouquets are sought after to observe the holiday, as are the quintessential Easter egg decorations. From devouring pastel Easter candy to filling grassy Easter baskets, gifts on this holiday use plants and flowers as metaphors for representing renewal and the sharing of hope. 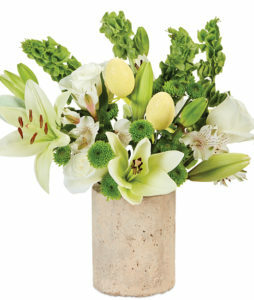 Integrating traditional Easter eggs and lilies adds a touch of whimsy to Easter flowers. Mixing flowers and nature with these Easter standards are a fun way to add a new twist on the traditional Easter floral arrangements. 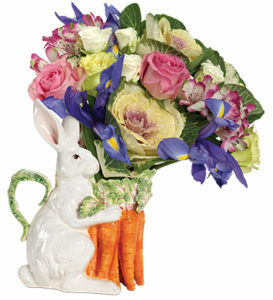 Our Bunny Bouquet features bright and fresh spring flowers and ornamental kale in a bunny pitcher. Bring this Easter bouquet to an event to delight guests or use at your own Easter brunch to pour mimosas. This is the perfect hostess gift, with a charming, ceramic bunny hugging an adorable bunch of carrots. 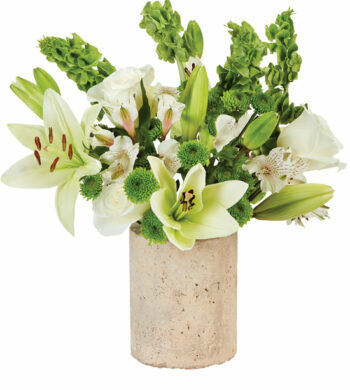 For something more traditional, lilies are your best bet. The traditional flower of Easter, lilies are often mentioned in the Bible as a joyous symbol of new life, hope, and spirituality. 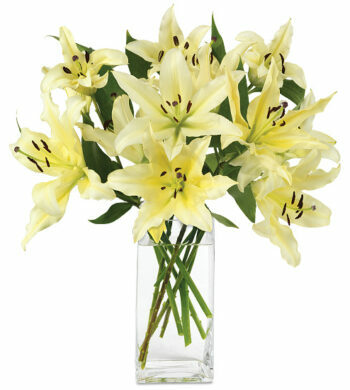 Easter lilies also have a lovely scent to welcome new hopes and life after the resurrection. If you are not one to celebrate the holiday, Easter flower arrangements are still like a step into spring with lively colors and a positive feel that works well for any seasonal celebrations or events you may have up your sleeve. Flowers, like Easter and Spring, are a beautiful symbol of ushering in new life.